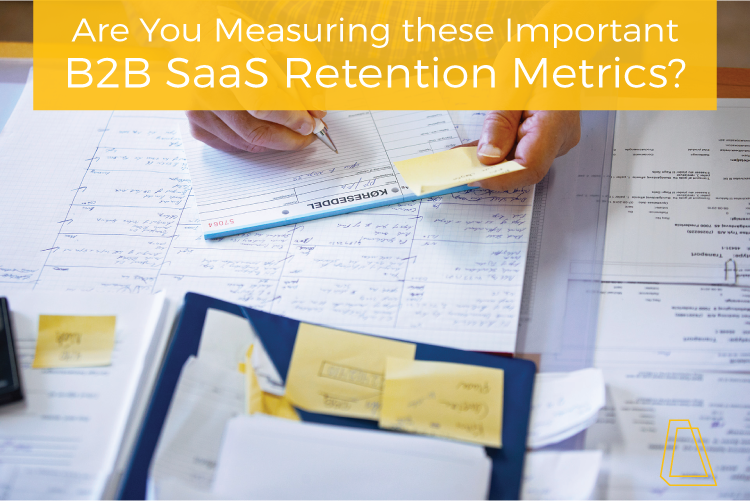 Are You Measuring These Important B2B SaaS Retention Metrics? When you have a B2B SaaS company in the startup phase, it’s important to focus on the most important KPIs (key performance indicators). As your B2B SaaS startup grows, you’ll add additional metrics to keep measuring performance. Many common KPIs focus on recurring revenue, acquisition costs and year-over-year growth. These are all important, but it’s essential that you also measure retention metrics. Even if you have great sales, if your churn rate is too high, then many of your new sales are simply replacing lost revenue. This scenario obviously impedes growth, so focusing on retention metrics is essential. In this blog, we’ll look at some important B2B SaaS retention metrics that you should be measuring. Note: For purposes of this blog, some calculations are simplified to serve as general examples. Why is B2B SaaS retention so important? To expand on what we discussed earlier, retaining clients and reducing churn is key to your overall revenue growth—and for increasing your valuation. Without focusing on important retention metrics, you may get fooled by high sales numbers. Likewise, if your company is too focused on sales, you may neglect servicing those clients and keeping them engaged. Your churn rate is simply the percentage of customers who leave—if you lose 10 customers for every 100 you have, your annual churn rate is 10%. Ideal churn rate will vary depending on your business, but we’ll use those numbers as we explore these metrics further. To have less than 10% annual churn, your monthly churn rate must be less than .83%. This is roughly equivalent to losing less than 1 customer for every 100 you have, each month. 5% monthly churn may sound like a positive metric, but it actually equates to 46% churn annually. That means you’re losing almost half your customers each year, so your sales team must sell that much more to keep up with your revenue goals. Two more key metrics to monitor are customer lifetime (length) as well as the average lifetime value of a customer. Find your customer lifetime length by dividing 1 by your churn rate. So if you have a 10% annual churn rate, your average customer lifetime is 10 years. If you’re calculating monthly, a 2% monthly churn rate would equal an average customer lifetime of 50 months (4 years, 2 months). You also want to measure your customer lifetime value in terms of revenue. To do so, multiple your average customer lifetime by your average revenue per customer (remember to use monthly revenue if you used a monthly churn rate to find your average customer lifetime, and vice versa for annual). In this scenario, you are spending $11,000 total to acquire and service a client that makes you $20,000 over 10 years. The last metric we’ll look at is net revenue churn. So far, we’ve looked at gross churn, the number of customers or amount of revenue lost each month/year. Net churn looks at lost customers but also incorporates additional recurring revenue (customer upsells/upgrades). This paints a more accurate picture of revenue lost per year. For instance, let’s say you lost $1,000 in revenue from customers leaving, but during that same period, you were able to add $800 in upsells to existing customers. Your gross churn for that period is $1,000, but your net churn is $200 (taking into account upsell revenue). Does your B2B SaaS retention plan need a little help? Check out this ebook on 22 B2B SaaS retention strategies you can implement today, or reach out to Milwaukee B2B marketing agency, Accelity Marketing.